Remember the Mann National in Westwood Village? The massive, single-screen theater was declared dead early in 2007 ... then it wasn't dead ... then it was gone for good and the structure was razed. I walked by the lot today and, with less than a month of spring remaining, all that's popped up are a few hundred weeds. 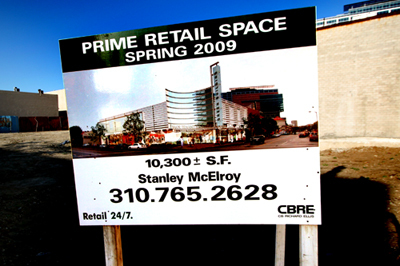 Once considered some of the choicest commercial real estate on the Westside, the recession has clearly taken a toll on Westwood Village. Home Depot closed the big Expo Design Center on Weyburn Avenue. Rite Aid moved to a new location at Weyburn and Glendon, leaving the large anchor space at Westwood Blvd and Kinross Avenue vacant. And even the Pinkberry at Lindbrook Drive and Westwood has closed up, along with many other shops throughout the Village. Time for a lot of new signs. Why was I at Ebert's funeral? Imported from Detroit ... Really?